Drop voicings are open chords which span more than an octave. They are very useful tools in music composition and arrangement and are greatly appreciated by guitarists for comping and soloing. The name drop 3 comes from the fact that you dropped the third highest note of a close voicing. If the drop 2 and 3 drop voicings are the most used and surely the first players learn when exploring jazz guitar, you have to know that there are drop 2-3, drop 3-4, drop 2 and 4 voicings and drop 2-3-4 voicings. However, these are not commonly played on the guitar because of their complexity, that's why this lesson focuses on drop 3 voicings only. You will see how they are built and how to play them on guitar by using the chord shapes and tablatures provided on this page. What are drop 3 voicings? 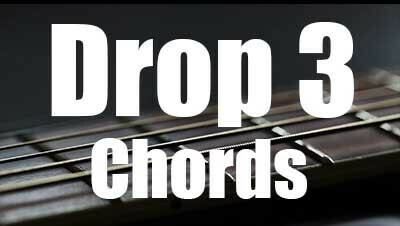 Drop 3 chords are very used by composers, arrangers, jazz musicians and of course by guitarists when playing jazz guitar rhythms. These types of voicings are excellent for accompanying a singer or a soloist, especially when you want to add a bass line. Indeed, the particularity of drop 3 chords on guitar is that the lowest notes are on the fifth and sixth string, allowing the player to detach more easily the basses from the other notes that constitute the chord. Drop 3 voicings are very used in chord-melody arrangement as you can hear in this video, a chord melody-arrangement of the famous jazz standard Beautiful Love. The term drop indicates lowering one of the notes of a chord to the octave. You need to know that a voice corresponds to a note, so the voice number one is the highest note of the chord, the second voice is the second highest note, and so on. It means that a four-note chord contain four voices. Let's take an example with Cmaj7 voiced in close position, it is built with C (1), E (3), G (5) and B (7). C is the fourth voice, E the third voice, G the second and B the first voice (the highest). To create a drop 3 voicing, you need as a basis a 4-note close voicing, as shown in the TAB with standard notation above, in which all four notes are within an octave. All you need to do is to displace the first voice (the highest note) to the bass, thus giving a new C major seventh voicing with the third in the bass. This new chord is called Cmaj7/E. How To Invert Drop 3 Chords? Now that you have understood how to build a drop 3 chord, you have to know how to inverse the notes in order to get 4 different drop 3 chords. Please note that inverted voicings consists of chords in which the order of the notes have been changed so the root of the chord is no longer the bass note. For a better understanding, let's take a look at the 5 voicing charts and 8 guitar neck diagrams below. They represent the most frequently used chords in jazz music, namely major 7, minor 7, half-diminished, dominant 7 and diminished. Each diagram below contains 4 guitar chord shapes. The first shape in black is the root position, the blues shape shows the first inversion, the red is the second inversion, then the green one corresponds to the third inversion. The highlighted area in yellow in the chart below is the voicing corresponding to the major 7 close chord previously seen in this lesson whose highest note has been dropped to the bass. This is the first inversion of the root voicing (R-7-3-5). This root chord produces two other inverted voicings. One with the fifth in the bass (5-3-7-R) and one with the seventh in the bass (7-5-R-3). Since dominant seventh chords are built with root (R), third (3), fifth (5) and minor seventh (b7), we get three inverted chords, 3-5-5-b7, 5-3-b7-R and b7-5-R-3 derived from the drop 3 root voicing which is spelled R-b7-3-5. Minor seventh chords are made of root (R), minor third (b3), perfect fifth (5) and minor seventh (b7). When the third highest tone of a m7 close voicing is dropped to the bass we get 4 Drop 3 voicings so eight guitar chord shapes as shown below. Half-diminished voicings are built the same way as minor 7 but with a diminished fifth. Once again here are 8 different drop 3 chord shapes to play on guitar. The particularity of diminished chords is that they are symmetrical. It means that the intervals are the same, so the chord positions and fingerings are exactly the same. Because of this symmetry we can deduce that all of the chords below contain the same four notes. This guitar lesson for beginners provide five easy exercises with tabs and standard notation to help you learn the most basic jazz chords using the voice leading technique.